He was a genre & landscape painter. He trained under J W Allen. Exhibited at the RA from 1883-1880 & at the York Art Gallery. 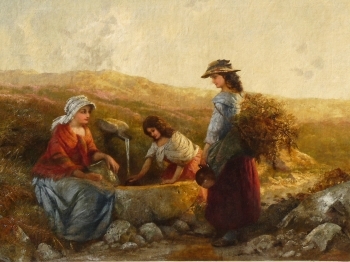 This work "Heather Bells", which was exhibited at Suffolk Street in 1859, The Art Journal said of it: "A company of colliers' daughters with such petticoats for colour & texture, & standing on a piece of hillside bottom, rich in grasses,& fragrant with sweet heather bloom. The figures are made to tell powerfully against the sky and distances".